What can IRS2Go do for you? 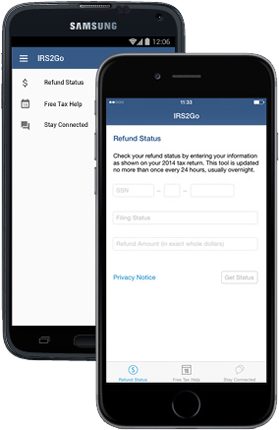 If you like to stay up to date with any aspects of your tax returns, news or refund, IRS2Go smartphone app might be the way to go (the app is available in English and Spanish). Get refund status – If you filed your taxes electronically you will be able to receive the first update 24 hrs after the IRS has received the return. To get your refund update, enter your social security number, filing status (Married Filing Jointly/Separately, Single, Head of Household), and the refund amount. Get educated – Learn where to find volunteers offering free tax help; the app will assist you finding the IRS Volunteer Income Tax Assistance (VITA) and the Tax Counseling for the Elderly (TCE) Programs near where you live. Get informed – Keep up with the latest tax news, scam alerts (typically phishing scams are very prominent this time around), and other relevant information. You can do it by watching the IRS videos on YouTube, follow the IRS on Twitter or Tumblr. Download the app from Apple App Store or Google Play Store for Android devices. This is a free app. Check out this short video overview to learn more about IRS2GO.